500 leaflets, printed in full colour on 250gsm Lumi Silk stock. Finished size: 296 x 100mm (so, similar to A4 divided in half length-wise). 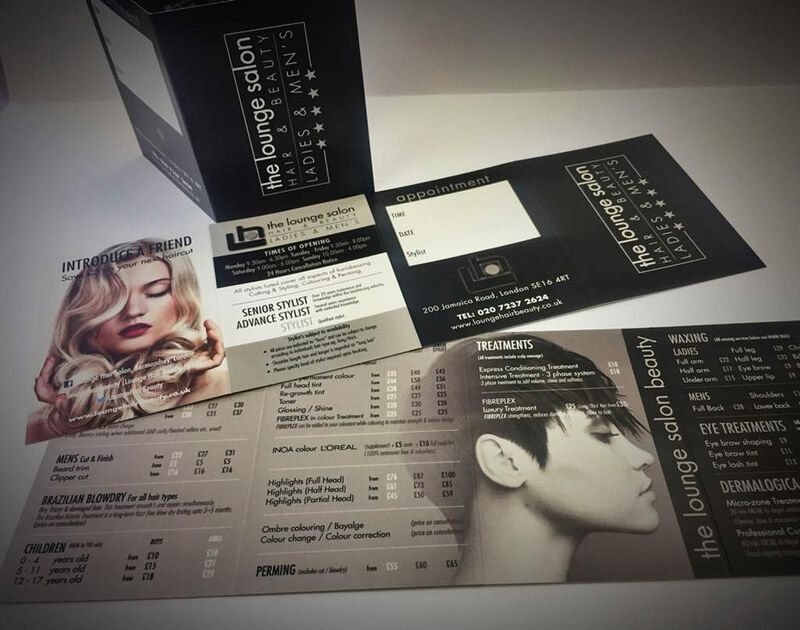 A6 customer detail pads, printed just in black on one side using 100gsm Navigator paper. 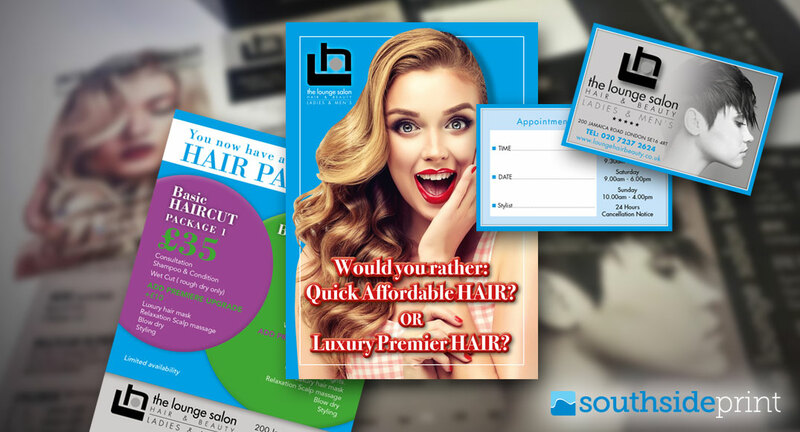 Lounge Hair & Beauty Salon was established in 2000 under the leadership of founding director and senior stylist Onay. The salon serves both ladies and men, offering a myriad of services including cutting, blow-drying, colouring and much more. Staff include L’Oréal trained colour experts who know all the latest trends including Ombré, Balayage, Babylights and Microlights. They are comfortable working with any hair type including fine, coarse, straight, wavy, frizzy or super-curly. They have an exceptional reputation around the Bermondsey area, with lots of repeat customers who come back year after year. As the name suggests, Lounge Hair & Beauty also offers a beauty treatments courtesy of resident beauty therapist Krystel, who is also an advanced hair stylist. Beauty treatments include conditioning, waxing, eye treatments, Dermalogica facials, micro zone facials and professional customised treatments that apparently provide phenomenal results. So, Lounge Hair & Beauty can cater for anything from a simple trim to a full make-over for special days like parties and weddings. The salon boasts 50 Google reviews with an overall score of 4.9 out of 5 — very impressive and a measure of how well they are regarded by their clientèle.